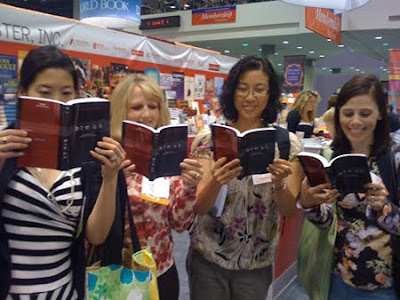 A group of celebrity authors were caught reading BREAK by Hannah Moskowitz. Left-to-right: CYNTHEA LIU, LISA SCHROEDER, CINDY PON, and TAMMI SAUER. This picture clearly illustrates that BREAK goes well with every outfit. LOL How fun...where should I send the pic? Kristi: you can email us at glambookshots at gmail dot com! !